Zombie slayers unite! You can depend on this full tang M48 Zombie Fixed Blade Knife in a zombie apocalypse or any other catastrophe for that matter. The razor sharp blade is ready to slice and dice while the partially serrated back can saw through wood and other objects. The handle is wrapped in almost 10 feet of paracord and can be unwrapped if needed. To top it off, this package comes complete with a FREE M48 paracord survival bracelet! I bought two of these knives because of the ads.While I think the knife is a good buy,I hate false advertising.The ad,and the box it comes in states that the blade is RAZOR SHARP! Bullcrap! I took knife #1 and tried to test cut paper,the operative word here is tried.The blade was so dull you couldn't cut melted butter,you'd have trouble cutting Jello. So thinking it was a fluke,I tried #2,same result.After an hr on each they are now razor sharp.Will they stay that way? I'll let u know later. I love this lightweight knife. It has the shape of a tanto with the weight of a steak knife. Very easy to maneuver and ridiculously sharp right out of the box. This is a great piece to have. Light weight and sharp right out of the box! The cord was a little uncomfortable but that is like most cord wrapped weapons. The sheath is pretty nice, and all together this is a great buy. I like UC products, but the design on this knife is strange in that the spine of the tang is sticking right up, and come to a point, and is uncomfortable in some applications. The 550 was also loose, and not wrapped heavy enough for a comfortable feel either. I got 2 of these in a bogo sale. After reading several reviews and seeing an average rating of almost 5 stars, I thought it would be a good buy. Several people had commented on the thinness of the metal and that they made good throwers once the paracord handle was removed. Well I was hanging out with a few buddies, drinking a little bit lol and we decided to do some knife throwing.. I had also previously purchased the black ronin throwing axe which preformed excellently but the m48 apocalypse knifes turned out to be a total waste of money, even at $10 a piece. The first one broke in half when my friend dropped it on the brick patio in my backyard. I thought wow what a poorly made piece of crap but maybe it was just a fluke.. Then a few minutes later the second one broke in half when I threw it at a cardboard cut out of a vampire. I wish I was able to post a picture with this review. Now I own a lot of knifes of varying quality and I truly believe that you get what you pay for.. These cost next to nothing because their quality is next to nothing.. I wasn't expecting much but I was still disappointed.. I'm going to send an email and picture of the broken knifes to united cutlery and see if they will stand behind their products and send me some replacements but even if they do I still would not recommend this knife for anything more than a play thing as the quality and dependability are poor. I would not count on them to defend myself, or as a survival tool..
Just got this in today and I am more then impressed,fits my hand with perfection,it's light weight and very sharp,I have not tested it out yet but the edge on the blade looks good but it's a thin edge,very well made and the price you cannot beat!Always happy with Budk. i got this for ten bucks with a promo code bkten284 !! bigger than i thought i will be but still nice. it is a very solid piece of steal. GET THIS!!!!! 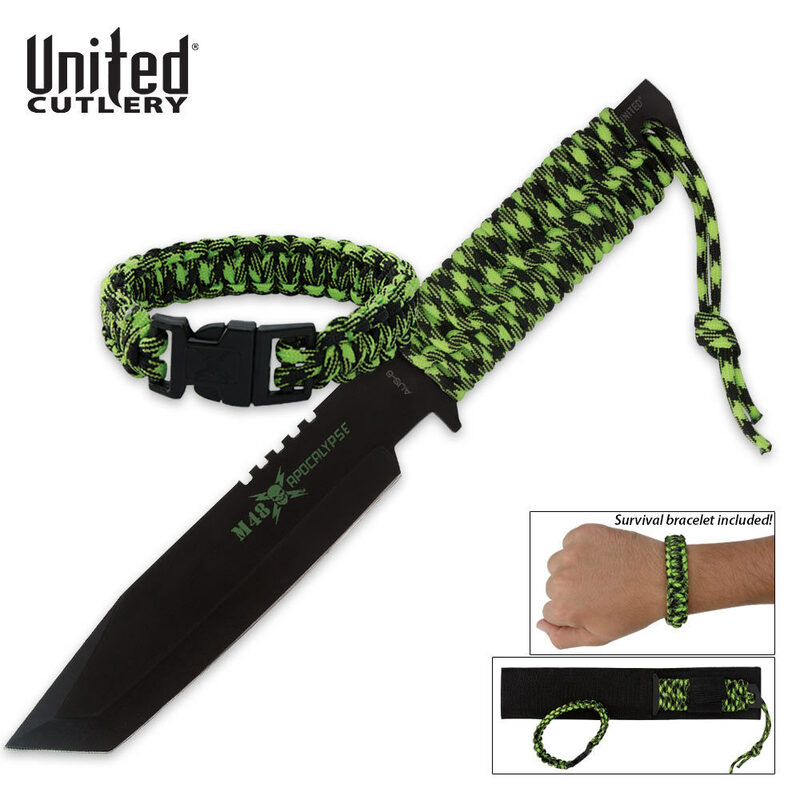 I got this knife and para cord braclet free with a large order a few weeks ago. The braclet was a bit big, so I shorted and rewove it. The knife is solid and comes pretty sharp, I used it to slice drain holes in some old tires I am repurposing. Went right through them. Also like that it could be made into a spear in short order. Solid piece of kit!!! Little thin width wise but still a good knife, keep mine in the truck survival kit. Great combo blade is sharp right out of the box. Planning on getting more sets. Thanks BUDK. Nice free knife, edge sharp, heavy construction.Will add to my survival and camping equipment definately.